He’s 15. His Dad was killed in a car accident when he was 6. He and his twin brother & younger sister now live with Grandma. He’s trying to figure out what it means to be a man. They’re 5 & 7. Dad is in jail. Mom struggles to pay the bills. She can’t afford or manage to get them involved in after school activities. They play video games. They struggle in school. She’s 22. Two kids under 3. No husband. Dad is in and out. Nothing she owns is in her name. She’s up at night worrying about the future. She’s ashamed. She’s afraid. She’s alone. He’s 20. Never knew his Father. His mom died of a drug overdose when he was 13. Her last words on her death bed, “Baby, please don’t do drugs.” She didn’t know it, but he was already an addict. He’s about to get out of jail. She’s 10. She wanders the streets till long after dark. House to house. Yard to yard. Playground to playground. Everyone knows, it’s a matter of time before she gets into trouble. On purpose or as a victim. She’s 16 & in the 10th grade. She’s pregnant. She’s thinking of quitting school. She’s scared to have a baby. What if we didn’t settle for inspiration? What if we made ourselves available to be imitated? What if we took the risk of relationship with those who need us the most? What if the families in my list above & those like them in all of our communities had a mentor or prayer partner or friend? Mentoring has been defined as “a brain to pick, an ear to listen to, a push in the right direction.” We’ve all needed it. Some of us have been blessed by it. Have we ever given it? 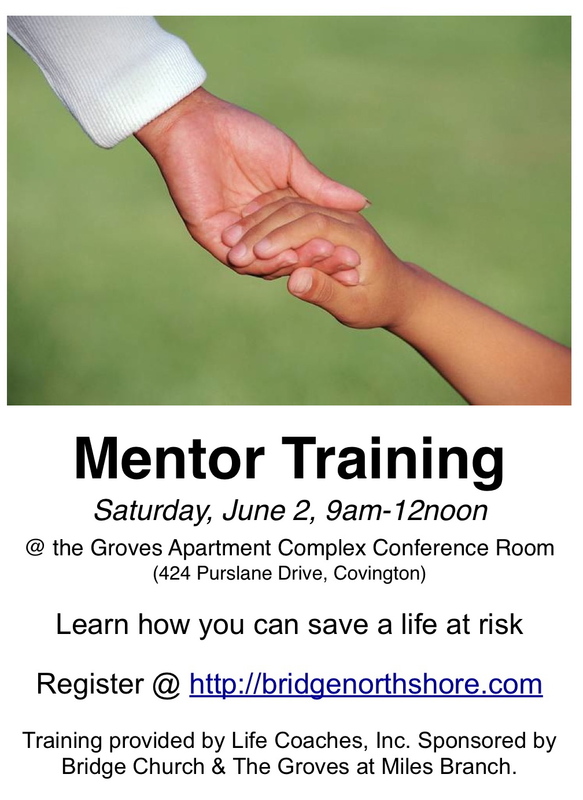 This Saturday, our church will be hosting a Mentor Training at the Groves Apartment Complex in Covington. Pre-register for the free training here. Posted on May 29, 2012, in Bridge Church, Discipleship, Faith In Action. Bookmark the permalink. 1 Comment. I wish I could attend. Praying you will have an influx of Mentors so more and more people can be changed. Thanks Lane And Bridge Church.